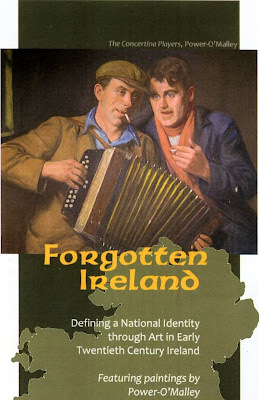 On Monday March 15th 2010 an exhibition titled "Forgotten Ireland - Defining a National Identity through Art in early 20th Century Ireland" will open in St. John Fisher College, Rochester, New York. The exhibition features works by Dungarvan born artist Michael Augustine Power O'Malley. O'Malley emigrated to America in the late 19th century and settled in New York. O'Malley's paintings have been loaned by his grand-daughter Marietta Whittlesey. Other artists featured include Charles Lamb and Sean Keating. The exhibition was organised by Mr. Ivan Lennon of Rochester. Ivan is the son of Dungarvan man, George Lennon, a major figure of the War of Independence and the subject of a recent book titled Rebel Heart by Terence O'Reilly. The exhibition runs until April 30th 2010. More information is available on the St. John Fisher College website. William Fraher museum curator, will give an illustrated talk on the artist on Wednesday 24th March at 8.p.m in the Town Hall, Friary St, Dungarvan. He has been researching the life and works of Power O'Malley for a number of years. The talk will feature illustrations of paintings, etchings and illustrations for books / magazines.